"This is the peerless guide to diploma scams. This well-documented study is in the same league as other famous exposés such as Jessica Mitford's The American Way of Death." A testimonial from Eyal Ben Cohen, Founder and Managing Director of Accredibase/Verifile, the world's leading private organization in the field of degree mill research and consulting. "There's an investigative vibe underpinning the book [containing] unforgettable characters and the narrative pace of a thriller. 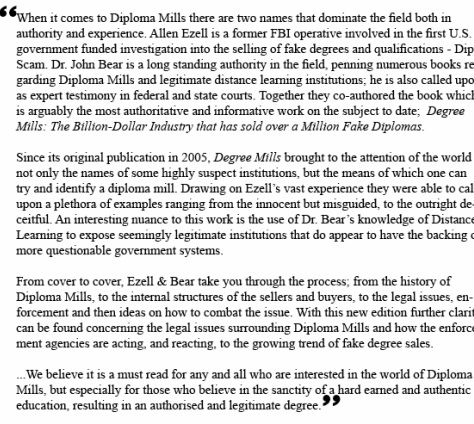 [Provides] consumers and employers with a bevy of research tools to spot fake degrees. . . . Ezell and Bear's investigative strengths shine a particularly bright and effective spotlight on a problem that has serious—and dangerous—repercussions."